Even though the football season is coming to a close, a lot of the bowl games are happening right now on the college level and in a few weeks, everyone will be watching the Super Bowl-whether for the game or the crazy over the top commercials that get just as much recognition as the event itself! But never fear!!! I have some recipes up my sleeve for the survival process that will not have you blowing away your New Year’s Resolution. So in order to make things right, I am taking advantage of this second chance I have and to make my Game Day Spread for the Superbowl to be a healthy one to remember. Although I have no menu set in stone, I wanted to share a couple recipes with you that I have tried (one being my own original!) that will be the talk of all of your non-vegan friends. In fact, you might want to have a few recipe cards handy because there will be a lot of requests about the awesome food you made! Now without further delay. This is my favorite chili recipe I created and before my vegan journey became a healthier one, this recipe already fit the bill. It’s full of veggies and it’s very versatile to suit your tastes or whatever you have handy. But this is the true blue original and it will knock your socks off! In a large pot over medium heat, water saute onion and garlic until translucent. Add serrano pepper, jalapeno, yellow squash, and green zucchini and cook for an additional 5 minutes. Combine rest of ingredients and cook until a slow-medium boil occurs. Then lower heat to simmer for at least an hour or longer. Season with salt (or salt substitute) and pepper to taste. If chili gets too thick, you can always thin it out with water or additional vegetable stock. Enjoy! This next recipe is the Ranch Dip I made recently and it was better than my old unhealthy version. The recipe originated from the cookbook, Vegan Celebrations by Alicia C. Simpson (and technically I’m sure this is considered a raw recipe!). In this book, Alicia never uses any processed faux meats and keeps the processed stuff to a VERY bare minimum so I found her recipes to be easy to adjust and also very satisfying. However, I found her Ranch Dip recipe to have too much dill so I toned it down. So here’s my version with the adjustments made, but I do recommend Alicia’s book and encourage all of you to check it out! Since this recipe is nut based, if you do not have a high speed blender like a Vitamix or a Blentec, it is suggested you always soak the nuts for 2 hours in water (enough to cover the nuts) and drain before using it in the recipe to soften them up. And last but not least, no Game Day Spread is complete without nachos!!! So, my favorite topping has been Isa Chandra Moskowitz’s Cashew Queso (it’s better to see the real deal on her site than for me to copy and paste everything here). I omitted the oil and just sauteed the veggies in a little bit of water. I made both the original and chunky version and fell in love with them equally. You can top this on any chip of choice but I would suggest making your own, using Chef AJ’s recipe for her baked tortilla chips. If anyone has any questions about their Game Day Spread, you can do so by either posting the question in the comments section or emailing me. 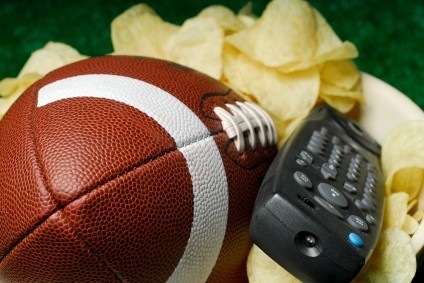 So, what are your favorite recipes during football season??? This entry was posted in Uncategorized and tagged Alicia C. Simpson, cashew queso, Chef AJ, chili, Football, Healthy, Isa Chandra Moskowitz, New Year, ranch dip, recipes, Sarah Kramer, Superbowl by Robin. Bookmark the permalink. Very cool. I'm glad you're getting a larger audience. Well deserved!